The State College Spikes baseball club of the NY-Penn League and LiveSource LLC are thrilled to announce a partnership to utilize the LiveSource mobile app for online auctions before, during and after games. The LiveSource platform will make it incredibly easy and convenient for Spikes fans to take part in live game-used jersey auctions without leaving their seats during games. In addition, it will give fans from all over the country an opportunity to bid on these and other special memorabilia and fan experience items. LiveSource will enable the Spikes to instantly reach fans with opportunities and in turn treat fans to constant excitement. “The State College Spikes are one of the most respected professional baseball organizations in the country. Just ask their peers, they are top notch. We could not be more enthusiastic and excited to be in business with Mr. Walker and the entire Spikes family. 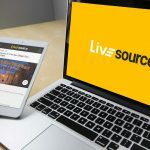 LiveSource will help increase their revenue and add excitement for their fans, and we can’t wait to get to work.” Said Scott Levin, founder and ceo of LiveSource.